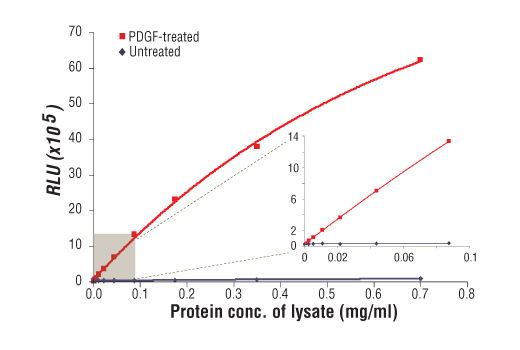 Figure 1: Relationship between protein concentration of lysates from untreated and PDGF-treated NIH/3T3 cells and immediate light generation with chemiluminescent substrate is shown. Cells (80% confluence) were treated with PDGF #9909 (50 ng/ml) and lysed after incubation at 37ºC for 5 minutes. Graph inset corresponding to the shaded area shows high sensitivity and a linear response at the low protein concentration range. NOTE: Refer to product-specific datasheets or product webpage for assay incubation temperature. This /product/productDetail.jsp?productId=luminescent ELISA is offered in low volume microplate. Samples and reagents only require 50 µl per microwell. 20X Phosphate Buffered Saline (PBS): (#9808) To prepare 1 L 1X PBS: add 50 ml 10X PBS to 950 ml dH2O, mix. Bring all microwell strips to room temperature before use. Prepare 1X wash buffer by diluting 20X Wash Buffer (included in each PathScan® Sandwich ELISA Kit) in dH2O. 1X Cell Lysis Buffer: PathScan® Sandwich ELISA Lysis Buffer (#7018) 1X: This buffer is ready to use as is. Buffer can be stored at 4°C for short-term use (1–2 weeks). Recommended: Add 1 mM phenylmethylsulfonyl fluoride (PMSF) (#8553) immediately before use. 20X LumiGLO® Reagent and 20X Peroxide: (#7003). Aspirate media when the culture reaches 80–90% confluence. Treat cells by adding fresh media containing regulator for desired time. Remove media and rinse cells once with ice-cold 1X PBS. Remove PBS and add 0.5 ml ice-cold 1X Cell Lysis Buffer plus 1 mM PMSF to each plate (10 cm diameter) and incubate the plate on ice for 5 min. Scrape cells off the plate and transfer to an appropriate tube. Keep on ice. Microcentrifuge for 10 min (x14,000 rpm) at 4°C and transfer the supernatant to a new tube. The supernatant is the cell lysate. Store at -80°C in single-use aliquots. Remove media by low speed centrifugation (~1,200 rpm) when the culture reaches 0.5–1.0 x 106 viable cells/ml. Treat cells by adding fresh media containing regulator for desired time. Collect cells by low speed centrifugation (~1,200 rpm) and wash once with 5–10 ml ice-cold 1X PBS. Cells harvested from 50 ml of growth medium can be lysed in 2.0 ml of 1X cell lysis buffer plus 1 mM PMSF. After the microwell strips have reached room temperature, break off the required number of microwells. Place the microwells in the strip holder. Unused microwells must be resealed in the storage bag and stored at 4°C immediately. Cell lysates can be used undiluted or diluted with sample diluent (supplied in each PathScan® Sandwich ELISA Kit, blue color). Individual datasheets or product webpage for each kit provide information regarding an appropriate dilution factor for lysates and kit assay results. Add 50 µl of each undiluted or diluted cell lysate to the appropriate well. Seal with tape and press firmly onto top of microwells. Incubate the plate for 2 hr at room temperature. Alternatively, the plate can be incubated overnight at 4°C. Discard plate contents into a receptacle. Wash 4 times with 1X Wash Buffer, 150 µl each time per well. For each wash, strike plates on fresh paper towels hard enough to remove the residual solution in each well, but do not allow wells to dry completely at any time. Clean the underside of all wells with a lint-free tissue. Add 50 µl of detection antibody (green color) to each well. Seal with tape and incubate the plate at room temperature for 1 hr. Repeat wash procedure (Section C, Step 4). Add 50 µl of HRP-linked secondary antibody (red color) to each well. Seal with tape and incubate the plate at room temperature for 30 min. Prepare detection reagent working solution by mixing equal parts 2X LumiGLO® Reagent and 2X Peroxide. Add 50 µl of the detection reagent working solution to each well. Use a plate-based luminometer set at 425 nm to measure Relative Light Units (RLU) within 1–10 min following addition of the substrate. Optimal signal intensity is achieved when read within 10 min. The PathScan® Phospho-Akt (Thr308) Chemiluminescent Sandwich ELISA Kit is a solid phase sandwich enzyme-linked immunosorbent assay (ELISA) that detects endogenous levels of phospho-Akt (Thr308) protein with a chemiluminescent readout. Chemiluminescent ELISAs often have a wider dynamic range and higher sensitivity than conventional chromogenic detection. This chemiluminescent ELISA which is offered in low volume microplates, shows increased signal and sensitivity while using a smaller sample size. An Akt rabbit antibody has been coated on the microwells. After incubation with cell lysates, both phospho- and nonphospho-Akt proteins are captured by the coated antibody. Following extensive washing, phospho-Akt (Thr308) mouse antibody is added to detect the captured phospho-Akt protein. Anti-mouse IgG, HRP-linked antibody is then used to recognize the bound detection antibody. Chemiluminescent reagent is added for signal development. The magnitude of light emission, measured in relative light units (RLU), is proportional to the quantity of phospho-Akt (Thr308) protein. Antibodies in kit are custom formulations specific to kit. PathScan® Phospho-Akt (Thr308) Chemiluminescent Sandwich ELISA Kit #7135 detects endogenous levels of phospho-Akt (Thr308) in human and mouse cells. This kit detects proteins from the indicated species, as determined through in-house testing, but may also detect homologous proteins from other species. PathScan is a trademark of Cell Signaling Technology, Inc. Custom Ordering Details: When ordering five or more kits, please contact us for processing time and pricing at sales@cellsignal.com.